Three time World Champion Oscar Freire is to give the TDF a miss in 2011 so that he reaches the start line in Copenhagen in perfect form. Oscar believes that he can add a fourth rainbow jersey that will lift him clear of the other three time winners Binda, Van Steenbergen and Merckx. There is more bad news for Cav as Freire plans to postpone his retirement so he can ride at the London Olympics in 2012. By 2012 Oscarito will be 36 and Cav will be stronger and hopefully just as fast so if it comes to a sprint it will be quite a battle. Until today I thought the Olympic road race was a non event but if Oscar says it is special that is good enough for me. Bring it on. Sporza review of the year 2010. As good a way as any to spend 1hr 15 minutes on a freezing day. The Manx spurter is planning to take his latest flame, the glamour model Peta Todd, to the Sports Personality of the Year event on Sunday. Miss Todd who was born in Newham, east London is a big fan of West Ham united her local team. Football is not her only sport as in 2008, she cycled 400 miles (640 km) in seven days raising over £3,000 through sponsorship and a further £4000 by auctioning her bicycle and cycling shorts on the last day of her ride for the “Help the Heroes” charity. It is rumoured that her bike realised £230 with her shorts (unwashed) making up the balance. It must be stressed that the photo was taken years before Cav had even met the southern stunner. The Lion of Flanders (one of many) celebrated his 90th birthday on the 7th December. All his great wins came in threes and the greatest of all was his three consecutive victories in the Tour of Flanders. Below is a summary of his career. Magni was born in Vaiano (Prato) on December 7, 1920 and started racing as an Aspirant in 1936 with AC Prato, winning four races that year. He gained twelve victories in the students class in 1937, included the League of Tuscany. As an Amateur in 1938 he won ten races followed by six in 1939 with the AC Montecatini and another ten in 1940. He turned Professional in 1941 with Bianchi with whom he rode until 1943. He won two races in 1941, four in 1942 and four in 1943. In 1944 he joined Monzese Pedale, then the Ricci in 1945 (two wins), the Visconti in 1947 (two wins) and 1948 (five victories including the Tour of Italy). He signed for Wilier Triestina in 1949 and won six races including his first victory in De Ronde. Seven wins in 1950 included a second Tour of Flanders. He retired from the Tour de France while wearing the yellow jerseywith the Italian national team at the insistence of captain Gino Bartali who had suffered abuse and threats by the French fans on the Col d’Aspin. 1951 was a wonder season with thirteen victories including a third Tour of Flanders, the Tour of Italy and the Italian championship. Ten hits in 1952 , two stages in the Tour among them.This was followed by his most prolific season with nineteen wins. In 1954 he was instrumental in introducing Nivea as the first non cycling sponsor to the sport. He rewarded them with twelve victories including the Tour of Tuscany. 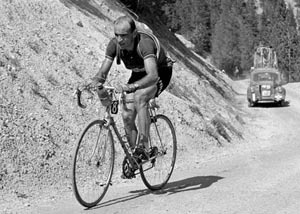 Again twelve wins in 1955 (Nivea-Fuchs) with the Tour of Italy and four stages in the Tour of Spain, and finally eight hits in 1956 (Nivea-Fuchs) that included the tours of Piedmont and Lazio. He was nine times in the top ten at the Giro winning in 1948, 1951 and 1955. At the Tour de France he took seven stage wins. At the World Championship he finished 2nd in Varese in 1951, 4th in Zurich in 1947 and 4th in Luxembourg in 1952.He was Italian road champion in 1951, 1953 and 1954. He won the Tour of Flanders in 1949 (7hr 21 min), 1950 (8hr 15 min) and 1951 (7hr 43min). As sporting director has guided the professional team of Leo-Chlorodont in 1957/58 and in 1960/62 Philco. Magni coach of the Italian national professional cycling team from 1964 to 1966. An amazing record with the standout achievement being his triple of triples in the Italian champs, the Giro and De Ronde.